Butler and Marquette battle for a loose ball during their meeting on Jan. 30. Photo by Jimmy Lafakis. 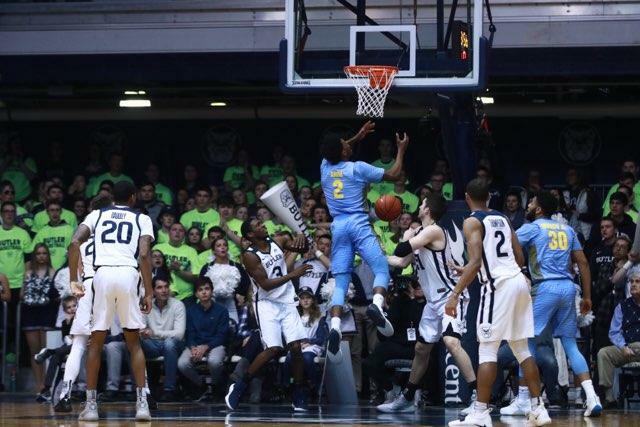 The Butler men’s basketball team dropped to 3-6 in Big East play with a 76-58 loss at home to Marquette. Butler held a 6-4 advantage for more than a minute early in the first half and never led again. Here are three takeaways from yet another discouraging loss. 1. Butler’s defense was better than it appeared. The Bulldogs guarded Markus Howard much more effectively than his 32 points on 61 percent shooting indicate. Time and again, he made shots that were simply unguardable. The key to stifling Marquette’s offense is not stopping Howard but rather making him do everything by himself. Sam and Joey Hauser, who average 25 points per game between them, had combined for five fouls and four points at halftime. Theo John took one shot and didn’t score. Marquette got only seven points off its bench. Howard was special, but the Golden Eagles are vulnerable when Sacar Anim is their second-leading scorer for most of the game. Even with Sam’s garbage time buckets, the Hauser brothers were below their season average, as was Marquette as a team. While the Bulldogs’ defense wasn’t anywhere near where it’s been at times this season, it was good enough to beat most teams on most days. 2. The 3-point line is not a major concern. Missing eight straight 3-pointers to start the game and connecting on only one of 11 attempts in the opening 20 minutes makes Butler’s offense appear worse than it was. The larger concern was the eight turnovers and unimpressive five points from Marquette’s eight turnovers in the first half. When a team isn’t shooting the ball well, capitalizing on every opportunity for an easy bucket becomes essential. The Bulldogs weren’t ruthless enough turning the Golden Eagles’ mistakes into points. Marquette turned the ball over five times in the first five minutes. It took Butler 13 minutes to get 12 points. The one bright spot in the offensive struggles was that the Bulldogs attempted more free throws than their opponent for the first time in Big East play. Butler continued to take quality looks from three when they were available but didn’t jack up unintelligent jumpers. There’s nothing to fix when a team shooting 37 percent from deep on the season goes 6-for-26. It’s just a bad game. Much like against Villanova, just about everything has to go right to beat the Golden Eagles. Losing the 3-point line that badly means there’s almost no room for error. Turning the ball over 12 times pretty much seals the deal. 3. The Bulldogs can’t get another quality win at home. If Butler is going to grab a signature victory before the Big East Tournament starts, it will be on the road. The Bulldogs’ rematches with Villanova, Marquette and St. John’s all take place away from Hinkle. Considering Butler is an underwhelming 1-5 on the road this season, it’s hard to envision the Bulldogs stealing one of those games. Of course, anything is possible. The one thing we do know is that the marquee win — or wins — Butler’s gotten at home the past two seasons will not be happening in 2018-19. The difficult road contests in the second half of the Bulldogs’ conference schedule means they’ve already played their most challenging home games. Butler should be perfect inside Hinkle the rest of the way, starting with Seton Hall on Feb 2. To have any hope of making the NCAA Tournament, the Bulldogs must take care of business at home. With the way the college basketball season is shaking out, nine Big East wins and another one in the conference tournament will probably be enough to go dancing. It’s certainly a tall task, but it isn’t out of the question.